I love chocolate. I enjoy tasting it every now and then, and as I write this post I have an organic chocolate bar sitting next to my laptop. 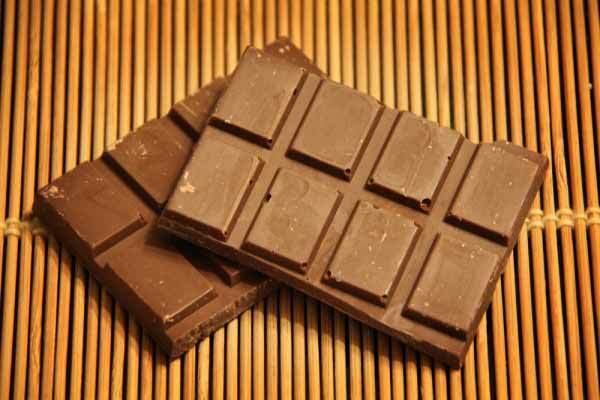 But, other than eating it, I knew nothing about chocolate nor how it’s made. 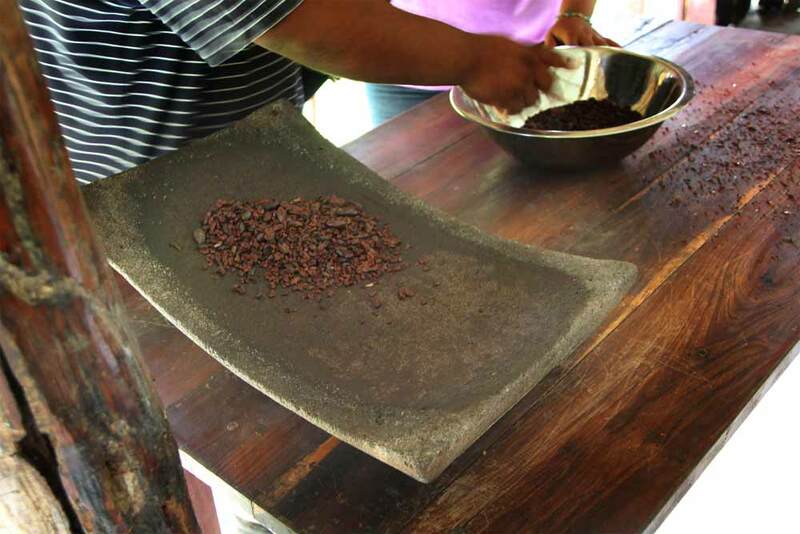 Here in Belize, I had the opportunity to learn how chocolate is made from raw cacao to final product. But what’s even more interesting is that I learned how to make chocolate like the Mayas did for over a thousand years. 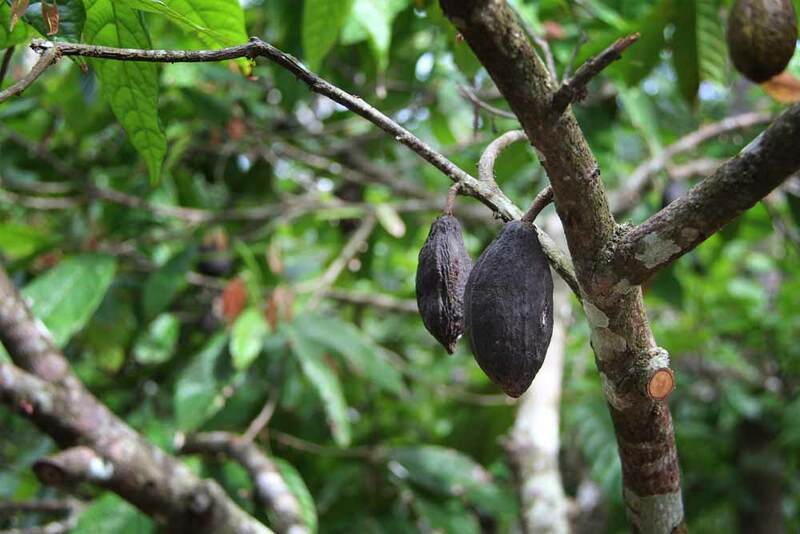 The word cacao originated from the Maya word Ka’kau’, as well as the word chocolate from Chocol’ha and the verb chokola’j – “to drink chocolate together”. 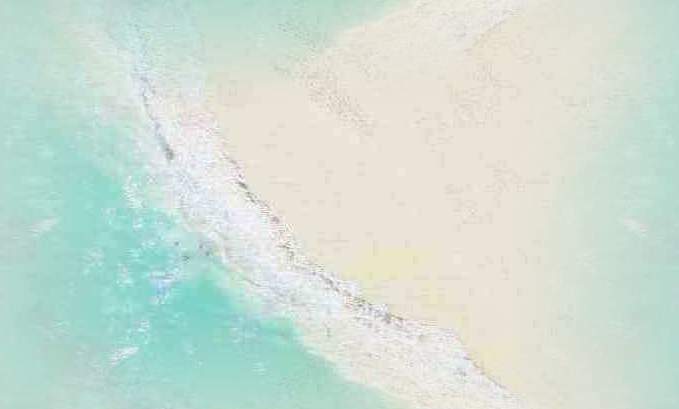 The Maya believed that the ka’kau’ was discovered by the gods in a mountain that also contained other delectable foods to be used by the Maya. 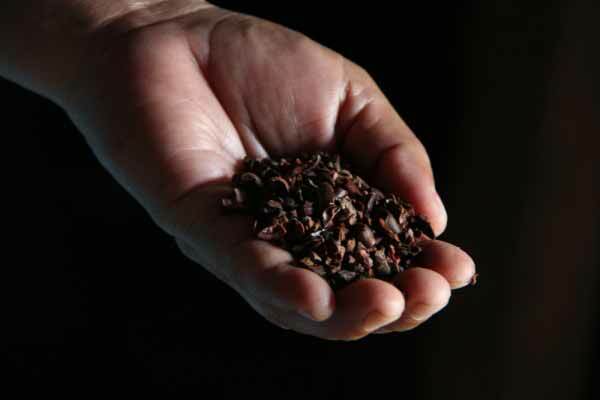 Since the cacao was revered as the drink of the gods, only the elite in the Maya society could afford to drink it. In addition, the cacao seeds were used as a form of currency, so only the wealthy had the pleasure of enjoying the delightful taste of chocolate. 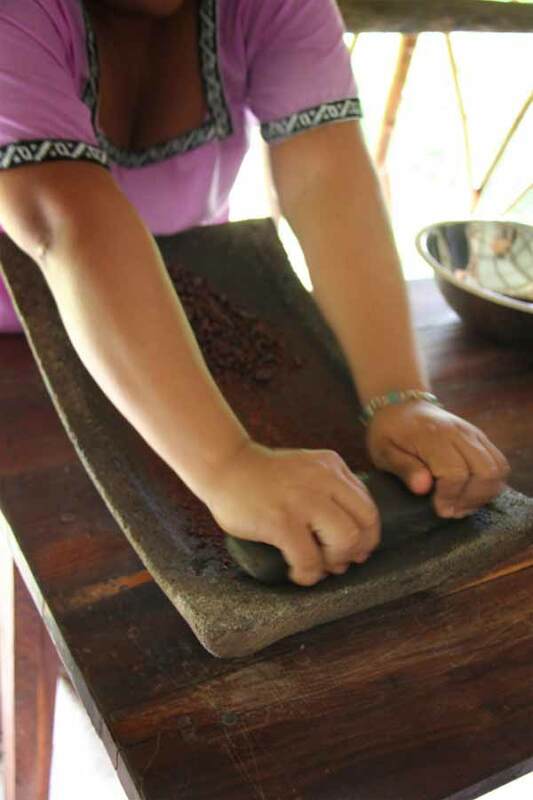 The Mayas passed on their knowledge of cacao through oral history and even in writing, documenting the use and importance of cacao in their daily life and rituals. Cacao comes from the seeds of a fruit pod that sprouts directly from the trunk or main branches of the Madre Cacao tree. When the fruit turns green-ish to yellow, it is ripe and ready to be harvested. 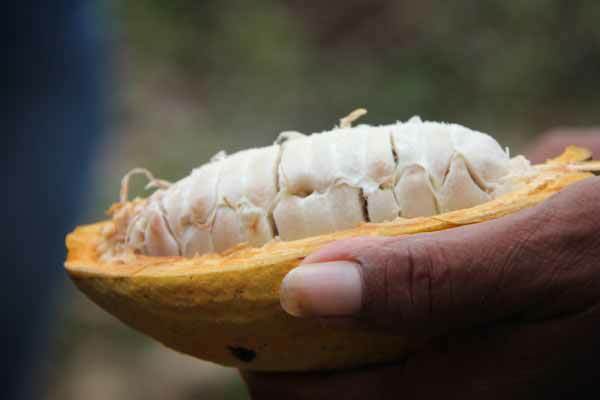 Inside the ripe pods are cocoa beans. These are covered with a soft white flesh that can be sucked. It has a sweet taste. The beans are collected and put in a wooden box for fermenting – for a period of 5 to 6 days. Then, they are spread in a flat exterior surface to be sundried. When dry, they can be stored in bags or used as needed. 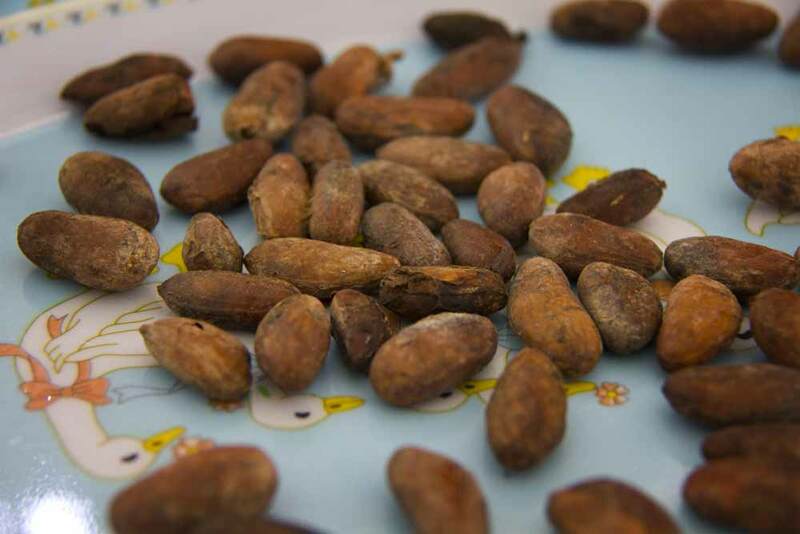 Before cracking the shell of the beans, they are roasted in the comal (a heating pan). The shells are thrown away. 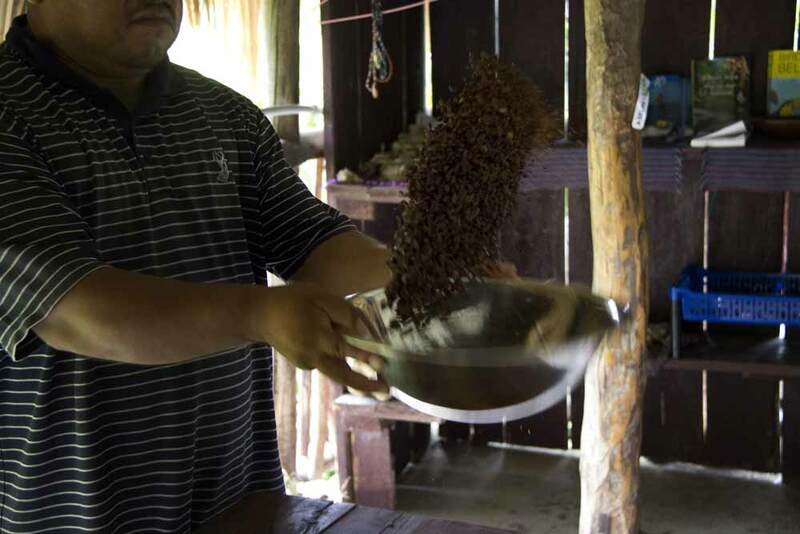 Juan Cho shows his skills in winnowing – the process used to separate the small pieces of shell from the beans. 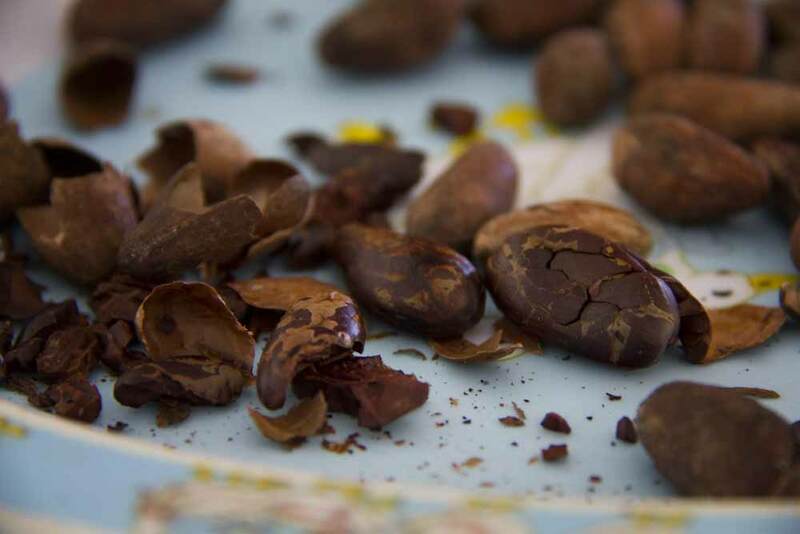 The beans are placed in a Matate, a volcanic basalt stone where they are grinded by hand. The beans have a percentage of butter inside them. When heated with the friction of the grinding process, they turn the crushed beans into a paste. Here, Abelina Cho is grinding the beans until they become a soft paste. This is the result of grinding the seeds for just a few minutes. 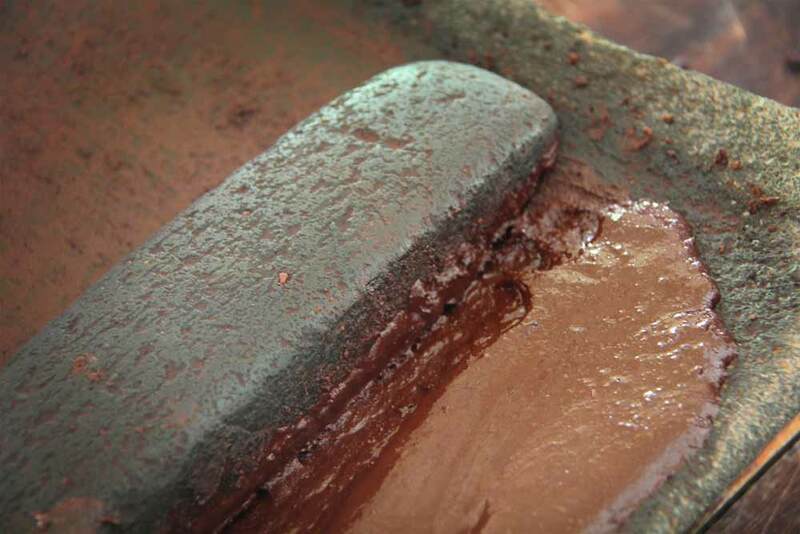 It can take 3 to 6 hours of grinding to achieve a smooth paste, depending on the smoothness desired. At this point, since the cocoa paste is in its raw form, 100% cocoa, its taste is bitter. Spices and flavors –butter, chile, black pepper, honey, and others– can be added to create a different taste and to reduce the percentage of cocoa. 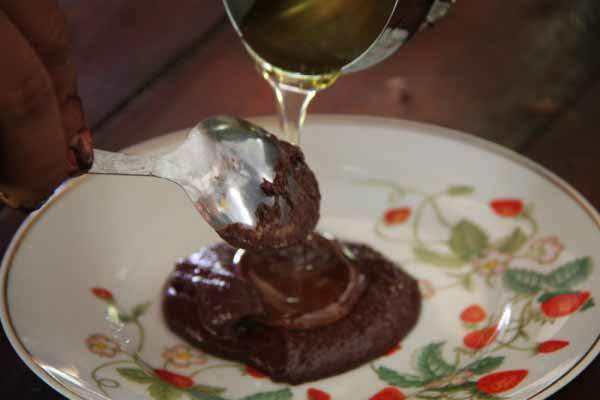 Pour the cocoa paste in molds (shown behind the cocoa products) and let dry at ambient temperature. 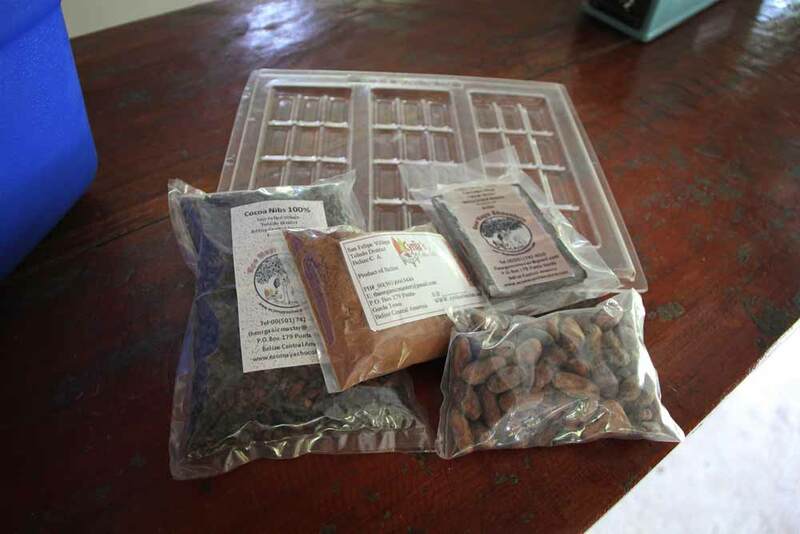 Add a few machines, bells, and whistles and you’ll have the modern chocolate making technique that other local Belizean companies like Kakaw Chocolate and Cotton Tree Chocolate use, but overall, the process is still similar to what the Mayas did for hundreds of years.